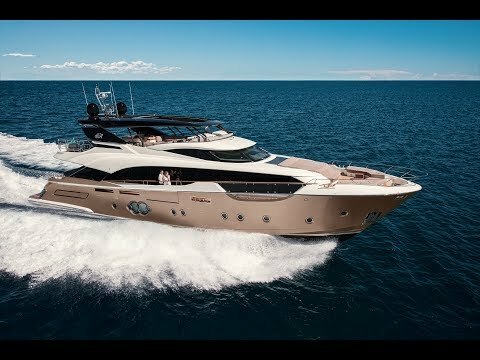 At 30 meters, the MCY 96 takes the second spot on the Monte Carlo Yacht’s size podium. The MCY 96 has been designed and developed for extended ocean voyages according to both Pleasure and Charter Yacht Rules, and may be also registered as a CE–A craft. Upon boarding, an instant sense of spaciousness becomes apparent. The new MCY 96 makes the most of the layout concepts currently found on larger models in its class: incredible volumes are obtained positioning the master cabin forward on the main deck, and as many as four guest cabins, all equally sized, located on the lower deck. MCY 96 was designed with special attention to safety during long crossings. New design and technical highlights include bulwarks that are sensibly higher than the current fashion and the wide overhanging side deck that gives good coverage from the natural elements.